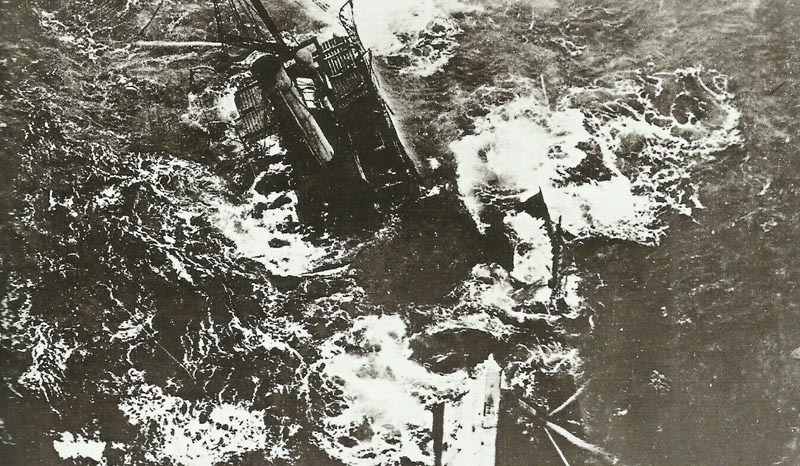 A steamer begins its final plunge to the bottom after a torpedo strike of a U-boat. British Admiralty advise British merchant ships to fly neutral ensign (or none) in home waters. Lusitania arrives at Liverpool on February 6 with flying US flag. Channel – first merchant ships torpedoed without warning: British steamers Tokamaru and Ikaria sunk off Le Havre by U20 (Schwieger). Argonne: French setback (700 PoWs) near Fontaine Madam. USA: Colonel House sails in Lusitania for Europe as Wilson’s special peace envoy. Belgium: King Albert receives Japanese Sword of honour. Southeast Cameroons: French occupy Yukaduma. Britain: Churchill sends Admiarl Carden Russian maps and plans of the Dardanelles defences.